I am frequently asked by my clients - as well as many random men and women - why nails do what they do. Why do they bend? Why do they break? Why do they peel? And more importantly, what can I do about them? What they do: they are very dry, can flake at the free edge, crack/break along the sidewalls, and are hard and brittle. Sometimes they will have vertical ridging, sometimes you'll see dry, flaky white spots. You know you have hard nails if you can't bend them by pressing down on the free edge. This hardness actually causes the nails to break (and not bend) when they are exposed to trauma. 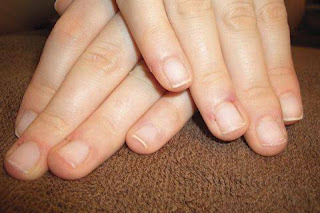 Often the skin around the nails appears dry as well, which can lead to hangnails. Why: They lack moisture. Moisture influences nail flexibility and durability by acting as a lubricant and a shock absorber. Use of harsh solvents, over-washing of hands and age are all contributing factors. If you have dry, hard nails, frequent exposure to water just makes your nails expand and contract every time, and when they contract they lose moisture. This can cause your nail polish to chip. Our northern climate contributes greatly to this lack of moisture in the winter months. Remedy: Use a conditioning cuticle oil daily (twice-daily is best but I recommend to my clients to use it at bedtime so that it will not be washed off but absorbed by your nails overnight). Make sure the oil contains oils such as almond, jojoba, or olive oil - the molecules in these oils are small enough to penetrate your nails. Avoid use of products containing mineral oils - they merely sit on the top of the skin and nails and do not penetrate. (And if you wear enhancements, products containing mineral oil can actually contribute to lifting). Any good professional cuticle oil will contain the right ingredients to do the job properly. How it works: Oils absorbed into the nails can slow down the passage of water through the nail plate. This results in less brittle and more flexible nails. Because oil does not evaporate as fast as water, it remains inside the nails, and increases the moisture content. What they do: they are very thin and bendy. 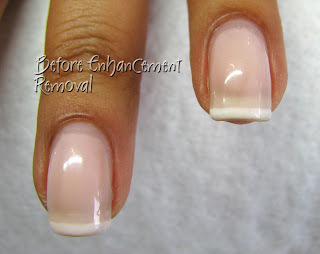 You know you have soft nails if they tear easily, bend and peel at the free edge. They are impossible to grow because they will tear. Nail polish will easily chip off these nails where they are peeling at the free edge. 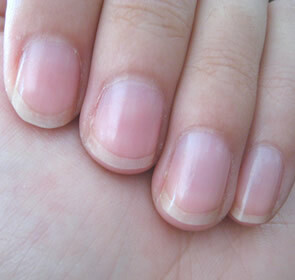 Check out the picture above and you will see a perfect example of this type of nail. 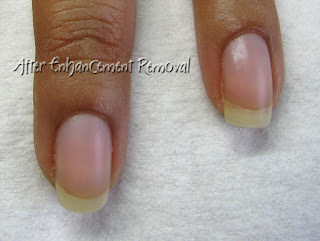 Why: They have too much moisture, which weakens the nail plate and causes this damage. If your nails are constantly exposed to water they can become soft and weak. This is why gloves are often recommended when doing any kind of housecleaning (not to mention save your skin from harsh solvents and chemicals). Remedy: Use a nail strengthener/hardener but the trick here is to only use it until you see that your nails are no longer soft and bendy. If you continue to use the nail hardener past this point, you'll start to dry out your nails and then you'll have hard, brittle nails that start to crack and break! Many clients don't know this vital part of the treatment cycle. Look for a nail treatment that specifically targets soft, thin and peeling nails and follow the manufacturer's directions. How it works: without getting really technical, they create more cross-links inside the nail plate which results in stronger nails with less room for moisture. 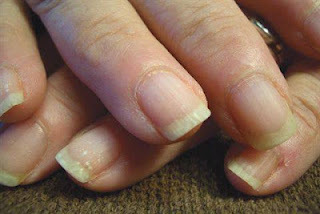 It's not that they dry your nails out - there is just less room for water and oil to reside. Overuse however as mentioned above will result in nails that start to become too hard. Too hard is never good for nails. What they do: they have the perfect balance of strength and moisture. These types of 'normal' nails have about 18 percent water by weight. These nails rarely break or peel but they will bend slightly when downward pressure is applied to the free edge. The skin around the nails is not dry. There is no remedy required for these types of nails because this is the optimum state for your nails. By correctly identifying the type of nail problem you have and taking steps to remedy it as I've described, you should be able to see a big difference in your nails in a very short time. There is no benefit to any nail treatment that includes seaweed, calcium or vitamins, or any other strange and wonderful concoction. These are not absorbed by your nails and are a complete waste of money. When searching for a nail treatment I would highly recommend you purchase one from a reputable, professional nail care company or directly from a nail technician who sells these products in their salons. I realize not everyone has access to their own personal nail tech or a salon who sells these products. Some names to look for: OPI (Nail Envy treatments, Avoplex cuticle oil), CND (Solar Oil) - both of these companies manufacture top of the line, professional-quality products. In the drugstore look for Sally Hansen or other similar companies who specialize in retail nail products. I hope this post has helped you manage your nail care expectations and better understand the condition of your nails! Many thanks to Nails magazine and Doug Schoon for the information and images included in this post. With November comes the cold and flu season with a vengeance. I've already had one minor cold come and go. Here's the thing. When I'm sick, I can't work, and I don't get paid. I can't 'call in sick'. I'm the boss. Not only can I not work if I'm feeling that crappy, I have to reschedule all my clients on the days I'm not well enough to work, or that I feel I will be contagious and pass along whatever bug or virus I have to you, my clients. And because I work from my home, it's not only my workplace but my home, that gets infected. I can't leave work to go home because I am home. And there are other people who live here, too, who might get what you got. 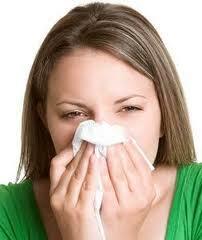 If you are sick, especially sick enough to stay home from work, please reschedule your nail appointment. Even if you have to call me at the last minute, as you are coming down with something. I completely understand and will appreciate it more than you know. When I do your nails, I am sharing your breathing space for an hour. We sit only a couple of feet apart. I am touching your hands the entire time. If you are sick there's a pretty good chance I'm going to get whatever you've got. If I'm working on your hands, there is no opportunity for you to blow your nose. Imagine how miserable that's going to feel for you. I've been seeing a lot of clients in the last couple of weeks with very dry nails, cuticles and skin. As summer turns to autumn, there is much less humidity in the air, and it seems we can feel the air sucking the moisture out of our skin and nails. You're not imagining it. I preach very few things in the studio, but the one thing I do talk about is the use of cuticle oil. Use it faithfully, every night before bedtime. Don't worry about applying it during the day because you'll just wash it off and waste product. If you are wearing any kind of artificial nail product on your nails (acrylic, gel, or gel polishes like Shellac) this is especially crucial, and here's why. As your nail grows out past the nail bed, it is exposed to the air and starts to dry out. As it dries out, it curls. If you have especially curvy nails - in the industry this is called a "C Curve" - this will be even more pronounced. If you never wear any kind of enhancement product, you won't even really notice this. If you do though, the product that is on top of your nails does its' best to keep up with this curling of the natural nails if you keep the underside (the natural nail) hydrated as it grows out. This is what the cuticle oil is for. If you don't use it, you may get what is called product separation, where the product starts to separate as the nail curls away from it. This is not the product doing this - it has nothing to do with the product or incorrect application. This is your natural nail curling away because it is dehydrated. If you apply cuticle oil underneath your nails on a daily basis at bedtime, you can really minimize the dehydration and dramatically reduce or eliminate this separation of nail and product. 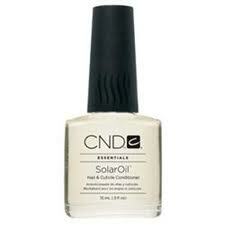 CND's Solar Oil is for sale in the studio; it is inexpensive and I recommend you purchase one at your first visit. When you go to your stylist to have your hair coloured, you want to preserve your investment for as long as you can. Think of Solar Oil as the perfect conditioner for your nails. I am seeing more and more new clients who are looking for something different these days. It might not necessarily be blinged out nails (though those are so fun to do!). No, what I'm seeing are clients who are educating themselves about what NOT to expect in a nail salon. Clients who are demanding something better than the status quo and are actively seeking out a new, safer experience. As of January 1, 2012, in Durham Region, the practice of storing an individual client's single-use (disposable) items for future re-use is no longer permitted. This means that all single-use disposable implements such as files, buffer blocks, sanding bands and the like, shall be appropriately discarded immediately after each use. They cannot be stored onsite or reused in the future on a client. No client will bring any such implement into the personal services setting for the purpose of being used by the operator on the client. So let's break this down. I offer my clients their file immediately after each service. It is theirs to take home and use if they wish, they are NOT to bring it back, ever. I have always done this in my studio, and didn't need any notice from Durham Public Board of Health to tell me this was an unsanitary practice. Sadly, I still hear stories from new clients about how their last place whipped out an obviously used file to use on their nails. In Durham. Next on the list are those wonderful foot spa pedi-thrones. You know the ones with the great massage feature? I choose not to use one of those for the simple fact they are time-consuming to clean properly between clients. Since I am such a stickler for safety, and I work by myself, I simply don't have time to do proper maintenance and I will never sacrifice time for the health of my clients. Fill the foot bath with detergent and water to above the water line and circulate the solution and clean the tub with a cleaning brush. Fill the foot bath with clean water and circulate the rinse water. Fill the foot bath with an intermediate-level disinfectant and circulate the solution, then let sit for at least 10 minutes. This is just in between clients. There is a whole other cleaning protocol that needs to happen at the end of each day. My health inspector and I regularly chat about this kind of stuff, and she knows it makes me crazy. We know many nail salons do not follow these protocols. Hats off to the inspectors here, they know all the tricks the salons play and try to make a difference but it must be frustrating to hear these practices still continue. On the one hand, I am gaining new clients from bad practices (hurray!) but I feel bad for all the unsuspecting consumers still out there who just aren't aware of what is and is not acceptable. Well, now you know. Not Shellac! This is a brand of gel polish manufactured and marketed by a nail company called CND. CND spent billions (well maybe not but it sure seems that way) of advertising dollars to launch this product over 2 years ago. And they've made sure to keep it top of mind ever since. Many people call my studio and ask if I "do Shellac". Well yes, I do. I have almost every colour in this brand. I've taken the course, I've gotten my certificate, I am well-versed in its' application and removal. It is a wonderful product. On the other hand, I've had new clients arrive in the studio with Shellac on, only to be told it's not Shellac. I get that quizzical look (happens every time). "What do you mean, it's not Shellac? That's what they said it was". Then I'm in the position of having to explain that perhaps they got something else instead. You see, the word "Shellac" is being tossed around because of all that marketing that CND did - everyone is using that to describe their gel polish services because it's the easy way out. Why should it matter? It matters when it comes to wearability and removal. I can remove a set of real Shellac in less than 10 minutes, with absolutely no damage to your natural nails. If you show up with Shellac from another salon, I really don't know what they used on you and you don't really know either. Might have been Shellac colour, with a different base and top coat. Or not. It takes twice as long to remove it, sometimes longer. So bottom line is, there are lots of other brands of gel polish out there. Some of them are absolutely terrific. But they are not Shellac. And I wish that other service providers would stop telling you it is. Finally! One of my goals this year was to start a blog. It's a great time to be a nail tech and many times over the past year I've wished I could share a great idea, or some timely, topical information in the big bad world of nails. So who am I writing for? My clients, potential clients, anybody who is concerned about nail health, interested in hearing about different nail products, what they are, what they do, why they are good (or not so good) for you. I hope to separate the truth from the BS that is out there, and my friends, there is a lot of it out there. I promise to keep you updated regularly with nail trends, new exciting products, and classic treatments. Hopefully you'll learn something and be entertained as well.